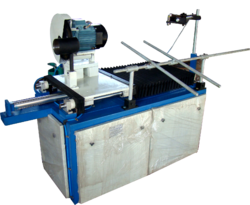 Prominent & Leading Manufacturer from Faridabad, we offer paper tube auto rough cutter machine. Paper Tube Auto Rough Cutter Machine is manufactured in docility with set industry norms using high-quality elements and sophisticated technology. The provided auto cutter machine is popularly known among the clients for its different qualitative features such as sturdy design, optimum performance, and long working life.